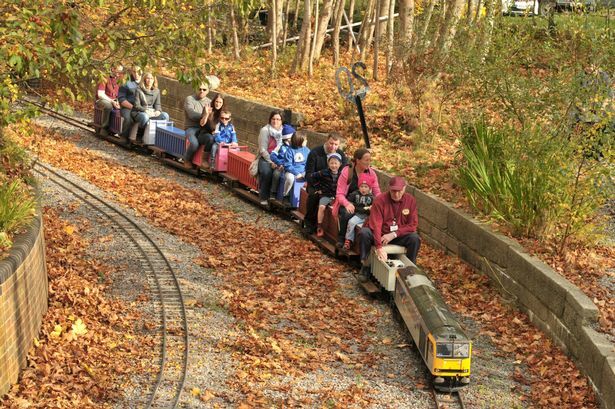 Mizens Railway is a passenger-carrying miniature railway situated in a delightful 10-acre site near Woking in Surrey. Click here for address and postcode. Operating on a track gauge of 7¼ inches, the railway provides a choice of runs, the longer one being nearly 1 mile in length, and a new route (The Highland Line) which is used when conditions permit. A schematic track plan is shown here. A variety of locomotives are in use, including several steam engines. The railway is generally open to the public on Sunday afternoons from the beginning of May until the end of September, plus Thursday afternoons in August. We also run on Easter Sunday and New Year’s Day. In additon, several Special Events are held including the very popular Santa Specials in December (for which advance booking is required). For details of running days see Timetable and Fares. In addition to train rides, the site has many other attractions – see Visitor Facilities. Mizens Railway takes its name from its original location at Mizens Farm, where the headquarters of McLaren is now located. We moved to our present site in 2000 and held our official opening there in May 2002. The railway is owned by Woking Miniature Railway Society Ltd and the entire operation is run by volunteer members.